A land of breathtaking landscapes, the Lakes and Volcanoes district covers three of Chile’s Southern Regions: the “La Araucania” Region, home to the native people (Pucón & Villarrica). The second covers the Huilo Huilo Biological Reserve in Los Ríos Region, this 100.000 hectares natural reserve based its development on three pillars: The conservation of the endemic flora and fauna, local community integration and sustainable tourism. And finally the “Los Lagos” Region, notable for its history of German immigration (Puerto Montt, Puerto Varas & Chiloé).This privileged area is home to numerous lakes, rivers, waterfalls, around one hundred volcanoes (ninety of which are active) and millennia-old native forests. From here you can also reach Bariloche in Argentina either by land or by an unforgettable journey sailing through the lakes of the Andes. 118 miles/190 km (3 ½ hours by car). 65 miles/105 km (1 hour and 40 minutes by car). 1 hour and 40 minutes flight from Santiago. 14 miles/21 km (30 minutes by car). 1 hour and 25 minutes flight from Santiago. Travel light, but pack sturdy, outdoor hiking boots. Take comfortable, layered clothing such as fleeces, t-shirts, swimming gear, long pants and long-sleeved shirts. Include an outdoor warm top for cold nights as well as a warm hat and gloves (during winter). Lip balm, sun-screen and sun glasses. Lakes Route from Pucón to Valdivia (Ruta de los Lagos) - Ojos del Caburga Falls & Caburga Lake (Caburga) - Huerquehue National Park (Pucón) - Villarrica National Park & Lake (Pucón) - Geometric Hot Springs (Coñaripe) - Huilo Huilo Biosphere Reserve (Puerto Fuy) - Llanquihue Lake (Puerto Varas) - Vicente Perez Rosales National Park (Puerto Varas) - German Colonial Museum & Teatro del Lago (Frutillar) among many others. Depart from Puerto Varas bordering the Lake Llanquihue in direction to Villa Ensenada. 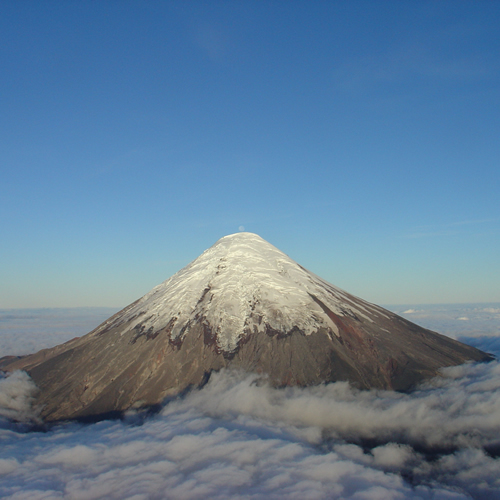 We will get to Vicente Pérez Rosales National Park where we will make an excursion to Osorno Volcano. 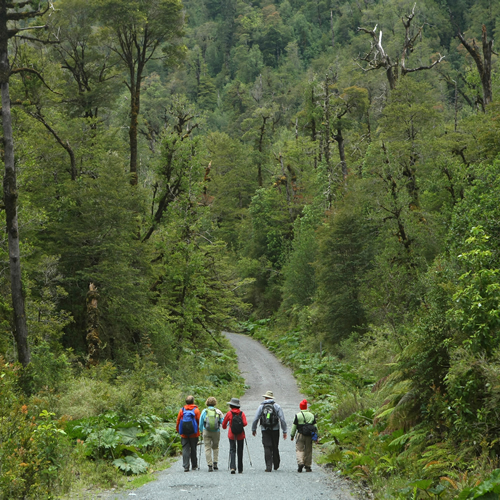 Walk through a forest of coigües and other native tree species, making a stop at 1,000 meters of altitude to observe La Burbuja Crater, admiring the view of the Petrohué River valley and the Calbuco Volcano in the magnificent Andes.At the end of the way we will get to the Osorno Volcano, where we can access their chairlifts to have a better view of the volcano. Depart from Puerto Varas head to the shores of the Llanquihue Lake. 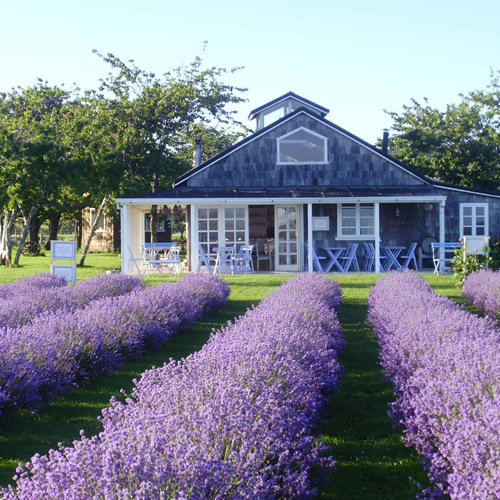 We will visit the beautiful city of Frutillar, a place where the peaceful life, cheerful gardens, colorful houses and tea rooms are mixed to perfectly represent the southern traditions and the German settlers throughout the region for its architecture, pastry and gastronomy. In addition, Frutillar has the Lake Theater, one of the biggest and modern of South America and also the German Colonial Museum which we will visit during our tour. Depart from Puerto Varas towards the south shore of Lake Llanquihue, until reaching the Vicente Pérez Rosales Park and where you will appreciate the Petrohué River Falls, where the river water flows over the volcanic lava rocks unfolding to an incredible natural spectacle. Next, board the navigation that will take us to Peulla, a small ecological village of 120 inhabitants forming part of the tourist circuit Cruce Andino®. 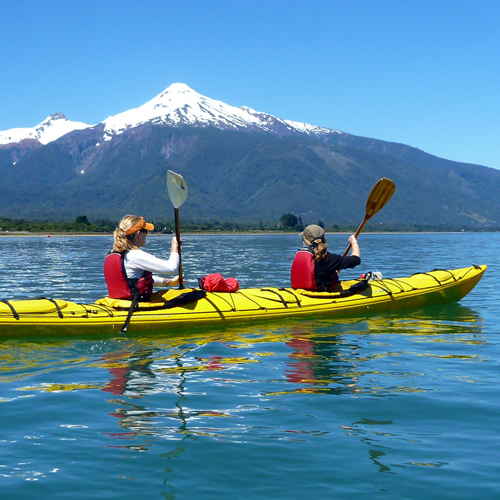 Sail Todos Los Santos Lake for 1 hour and 45 minutes, and observe the Osorno, Puntiagudo and Tronador Volcanoes. In Peulla, we will have the opportunity to participate in some of the available outdoor activities, visit the waterfall known as the Bridal Veil or simply enjoy the tranquility of this place. Finally, embark for your return to the city of Puerto Varas. Departure from Puerto Varas. 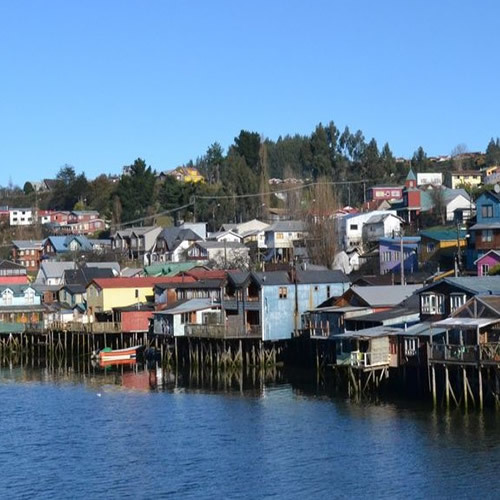 Once in the Island of Chiloé, we will take direction towards Dalcahue, where we will stop in the sector of the coast for a walk and visit the Craft Market, Museum and church. By coastal route Llao Llao we will continue our trip to Castro. Later we will visit the neighborhood of Palafitos de Gamboa, the main square and church of Castro, finishing our tour in the church of Nercón. Return to Puerto Varas. Our trip will take us over antique roads between the towns of Puerto Varas, Llanquihue and Frutillar. 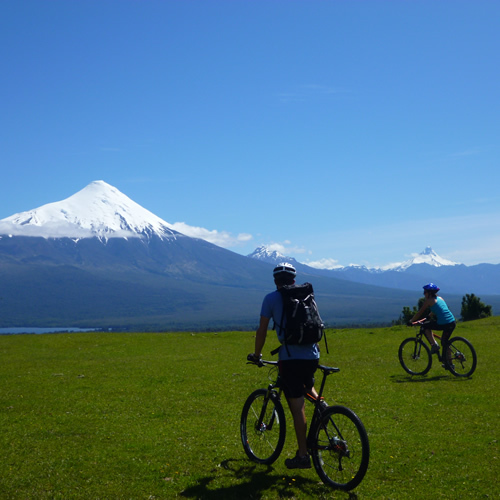 We will bike along the waterside and see some old houses, lonely beaches and always will have an amazing view of the Osorno, Calbuco and the Monte Tronador Volcanoes. The total trip distance is 30 kms on a mix of paved and dust roads, to get to Frutillar and with uphill and downhill parts between Llanquihue and Frutillar. Once in Frutillar, we will visit the Teatro del Lago and Colonization Museum, to know some of the history and culture of this town before we return to our hotel in Puerto Varas by vehicle. In Peulla, Canopy is the best alternative for people who love adventure activities and for those who like to be in touch with nature, sliding among evergreen trees and enjoying nature from a different angle. Once each participant is fully equipped with all the necessary security equipment, our adrenaline filled adventure will start. 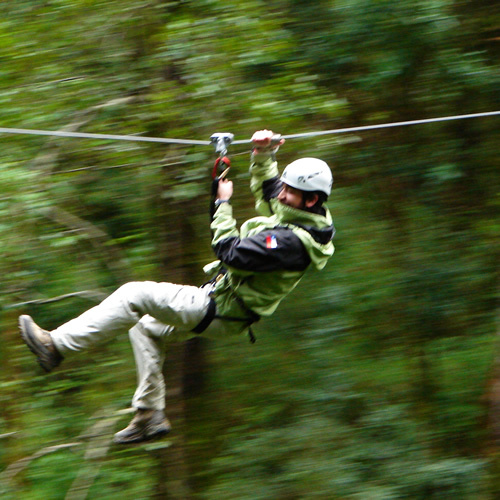 This 800-meter long course reaches heights of up to 15 meters within a dense evergreen forest of Coigüe trees, next to Velo de la Novia (Bridal Veil) waterfall. After finishing the activity we will return to Peulla. We depart from Puerto Varas along Llanquihue lake to the Whitewater Rafting base in Ensenada. According the climatic conditions (tide and wind) different routes are suggested to ensure maximum safety at all times. We will enter the Estuary of Reloncaví, the first fjord of the South of Chile and in the Bay of Ralún where the Petrohue River enters the fjord. After cross the peninsula we will have sight to the volcanoes Yates and Hornopíren. Then we will have time to lunch. Before to go on, we could walk to the camp and enjoy incredible views that give us the height. Back in the kayaks is time to continue southwards among the beautiful landscape of the Alerce Andino National Park. Finally we will cross the Fjord towards the entrance of the village of Cochamo, located between the Andes Mountains and the Pacific Ocean. The Cochamo Valley and its granite big walls is world renowned between rock climbers and also offers incredible places for hiking activities. This is where we will get out of the water and where our van will await us before driving back to Puerto Varas. 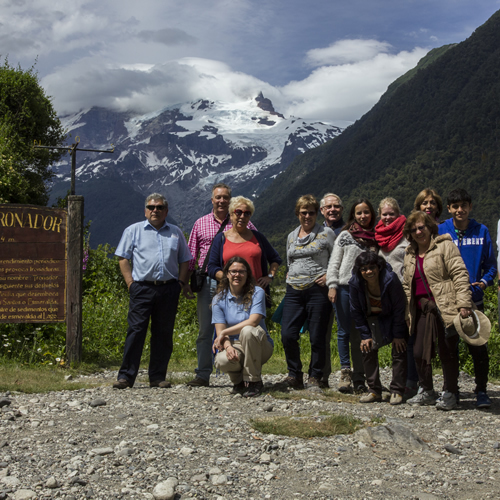 We will start our experience from Puerto Varas to the beginnings of the Austral Road bordering Seno Reloncaví. Our arrival to Chamiza River indicates that we are near to Chapo and Correntoso lakes, a little town known for its colorful cemetery and the architecture of its houses built with larch shingles. We will continue in car about 2,5 kilometers of gravel road until the Alerce Andino National Park entrance, where our ranger will welcome us. Our first step of trekking will be a 45 minute’s walk through forests and wooden walkays where the Valdivian forest flora is present up to Sargazo Lagoon. From that place we could continue our experience walking until arrive to the other side of Laguna Sargazo where we will see a small river. In this way we will find the most characteristic of this park: A stand of larches where we can see a lot of millenary larches. We will end this formidable hike arriving to Laguna Fría completing 9,5 kilometers. Later, we will know Calbuco, town founded in 1602, relevant in the Spanish conquest of southern Chile. Here we will know its famous cuisine based on fish and seafood and its architecture where we can see the “Fuerte San Miguel” and its riprap.